Wasn’t that the name of the Big Ten divisions when the expanded and split into the two divisions? One of the historical reasons for admitting the Dakota Territory as 2 states was to get four additional GOP senators instead of two. Really? Hell, I could make an argument that Vermont should be SPLIT 3 ways...not merged. Split three ways? But Vermont is already the third smallest state. True but, if you go out to dinner with friends at Applebee's, it often makes sense to split the bill three ways. And a whole state—even Vermont—is much, much bigger than that. Everything except #4, as well as the proposal to merge the Dakotas, will require consent of one or more state legislatures, as well as Congress. Even one of the simpler ones (splitting up California or New York, which would require consent of only one legislature and Congress) has been a tough sell in California lately, as discussed in multiple threads on this forum. The other one not on your list, but often discussed on this forum (so no need to repeat that discussion here), is returning most or all of the District of Columbia to Maryland. Good luck with pulling that off! I used to fantasize about Oklahoma merging into Kansas and having KDOT take over our roads. 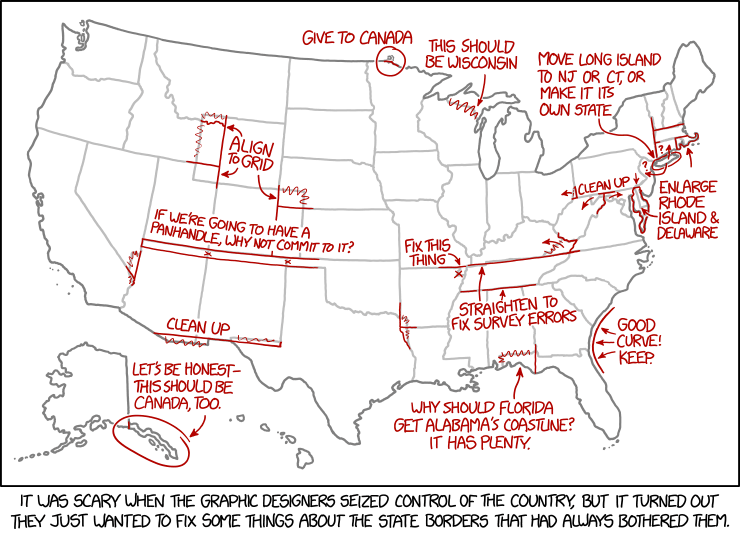 The panhandle would look REALLY silly then, though. Obviously, this is an academic exercise, as there will never be any shifting of state lines, and the difficulty of splitting or merging the 1000 functions of state governments is beyond complex. However, due, in the east, to crazy western claims of the original states (compounded in WV's case by the tragic separation of WV from VA) ; and in the rest of the country, by rushing states to statehood before full settlement and crazy borders drawn in Washington by people who, mostly, had never been west of Cincinnati, the states often comprise people with little in common with one another, and of vastly different sizes. It is not hard to come up with 50 units, even using current county lines, of people with similar interests, culture, and economy. I think Norris and Smythe sounds better. "MegaKota" sounds like either a bad supermarket chain or an intestinal disorder. At this point give all of Alaska to Canada. DC got some of it.